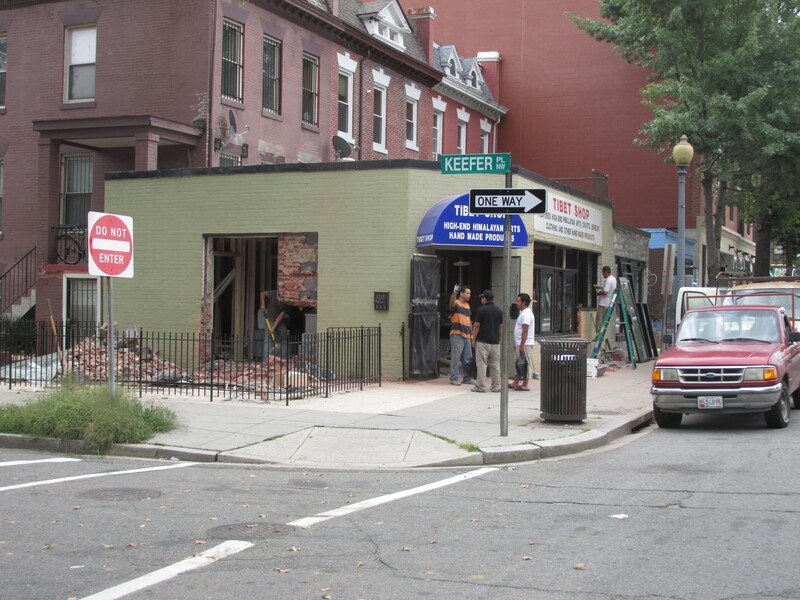 New Coffee Shop Is Moving Forward at Georgia and Keefer | Park View, D.C.
Nearly a year ago, after the Tibet Shop had closed, we learned that the building on the southeast corner of Keefer and Georgia Avenue was destined to be a coffee shop. Since then, there has been little activity to suggest that this dream would become a reality. However, that all changed this past weekend. Workmen were busily enlarging the store’s windows along Georgia Avenue and had cut out a large opening facing Keefer to install a doorway into the outdoor sidewalk cafe area (See photo below). (3213 Georgia Avenue — at Keefer Place — with renovations in progress). Selective demolition. Construction of new non-load bearing partitions,electrical, mechanical, plumbing, finishes and all related appurtenances of retail sales to Deli, Coffee shop in 1st floor of a 2 floor building. This entry was posted on August 4, 2014 at 7:01 am and is filed under Development, Small Businesses. You can subscribe via RSS 2.0 feed to this post's comments. Excellent news. We have virtually no healthy lunch options on Georgia north of Howard right now. A sandwich menu similar to Sankofa’s would be a great addition to the neighborhood. Hmm, it says a two story building but it looks like just one. Does this mean that they plan to have some sort of rooftop? I believe those storefronts are a part of the houses behind them, so that’s where the second story is. Great news, especially the deli part. I agree with Kent that the area should respond well to that.